Mazda is offering its very impressive Mazda 6 2.0 Skyactiv 145PS SE-L for just £243.93pm on a 42 month PCP after a £3,000 deposit, with a final payment of £6,423.88 to keep the car. Peter Allibon, Mazda UK Sales Director, says; "With monthly payments now akin to those of a smaller, less well equipped alternative, it offers customers a more premium executive option at a very competitive price." . Its striking good looks, premium build quality and comprehensive standard equipment specification combine with highly-competitive pricing and low running costs to award the Mazda6 a unique status in the C/D segment. In 2003 the Mazda6 out-sold several mainstream rivals to private buyers in 2013, including the Ford Mondeo and Toyota Avensis. Now, thanks to a new retail offer by which UK customers buying the Mazda6 could be entitled to a £1000 Mazda Finance Deposit Contribution towards both Personal Contract Purchase (PCP) and Conditional Sale agreements, that traditionally keen pricing has become even more competitive. Whichever offer customers choose: Zero deposit with 0% APR Representative PCP, 0% APR* Conditional Sale with 30% deposit or 5.9% APR* Conditional Sale, their monthly payments may be on a par with (or even lower than) those for a smaller, less well equipped alternative. For instance, based on a 42 month PCP with a £3000 customer deposit, a £1000 Mazda Finance Deposit Contribution and 0% APR, the £20,395 Mazda6 2.0-litre Saloon SKYACTIV-G petrol 145ps SE-L will cost from just £243.93 per month. Available to retail customers from February 1st to March 31st 2014, this outstanding offer makes the Mazda6 an extremely attractive proposition to those who have not previously considered upgrading to a C/D segment vehicle. 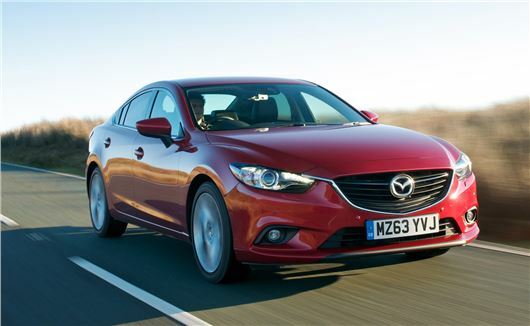 The 2014 Mazda6 range comprises 20 saloon and 16 tourer models with prices starting from £19,595 and £21,315 respectively (on-the-road). Depending on model, there is a choice of six equipment levels (SE, SE Nav, SE-L, SE-L Nav, Sport and Sport Nav), two petrol engines, two diesels and six-speed manual or automatic transmissions.